Click on map to expand to full size! 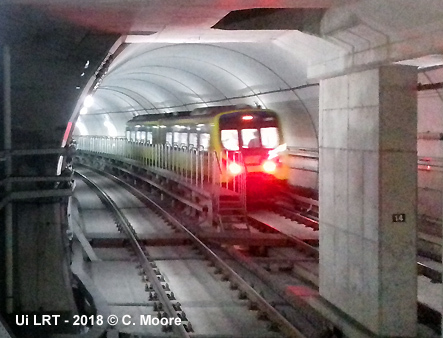 Seoul Metro runs lines 1-8 after the merger in 2017 of Seoul Metropolitan Subway Corporation (Seoul Subway) (lines 1-4, constructed between 1971 and 1994) and Seoul Metropolitan Rapid Transit Corporation (SMRT) (lines 5-8, constructed between 1990 and 2000). 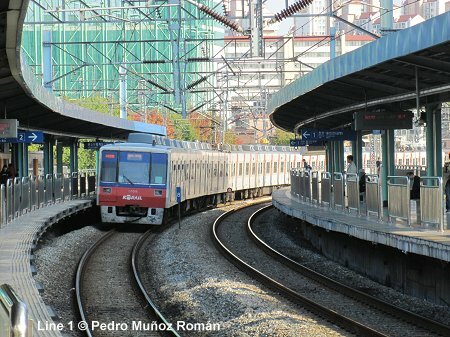 Veolia runs line 9, opened in 2009. 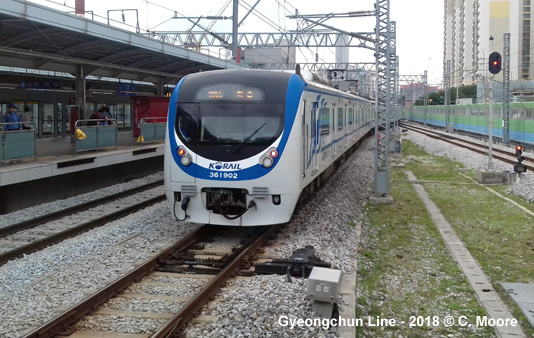 Korail (Korea Railroad, formerly Korean National Railroad) operates line 1 (except from Seoul station to Cheongnyangni), the Ilsan line (line 3 north of Jichuk; now depicted as line 3), the Gwacheon and Ansan lines (line 4 south of Namtaeryeong; now depicted as line 4), the Bundang and Suin Lines as well as the Gyeongui-Jungang, Gyeongchun and the Gyeonggang Line. 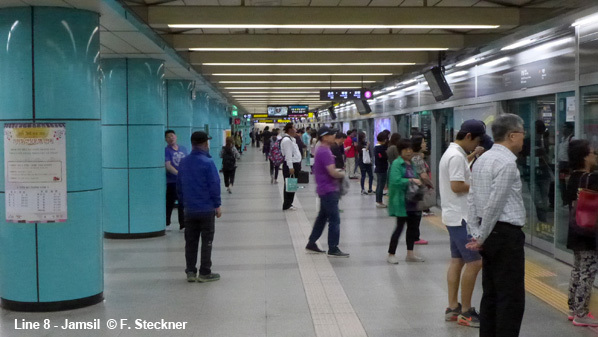 In the 1990's, Seoul has carried out probably the world's most ambitious subway extension program adding 160 km of new lines to the network. 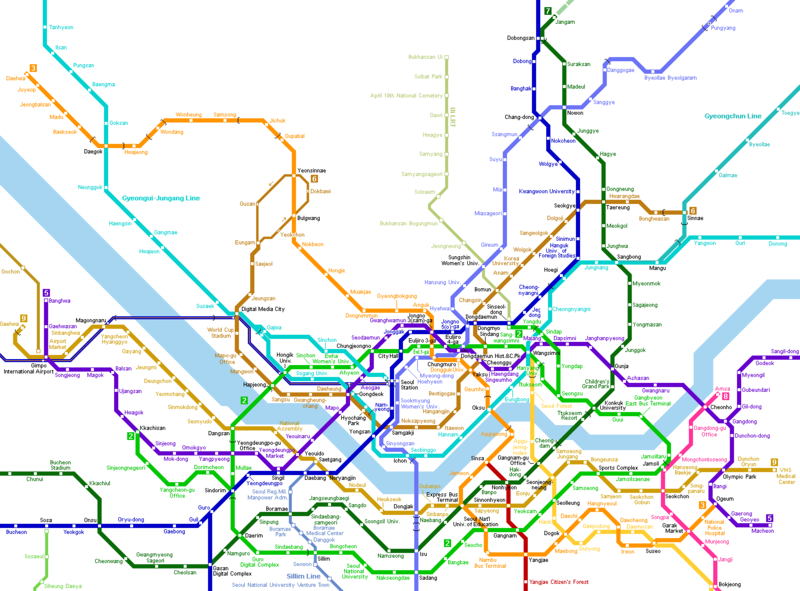 This included the extension of former lines 2, 3 and 4 (15 km) and 4 totally new lines of which line 5 is 52 km long (including both eastern branches). 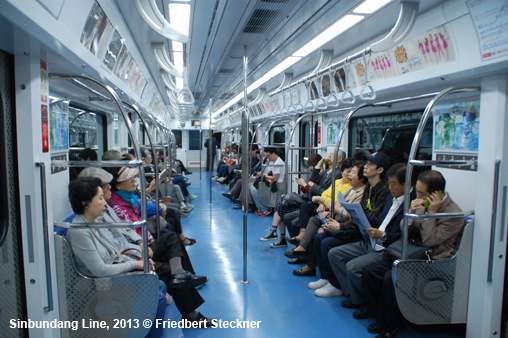 New maps also include Incheon's first subway line which is linked to the Seoul subway network via Line 1. 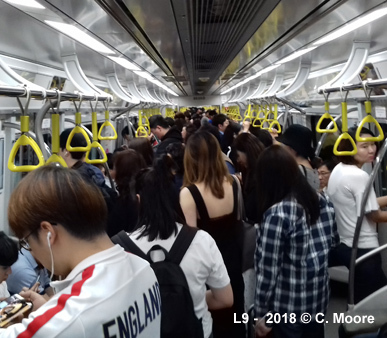 Line 1 was built 1971-1974 and opened 15 Aug 1974, crosses central business district, directly linked to Korail Kyoungbu, Kyongin (68.5km) and Kyongwon (31.2km) lines. 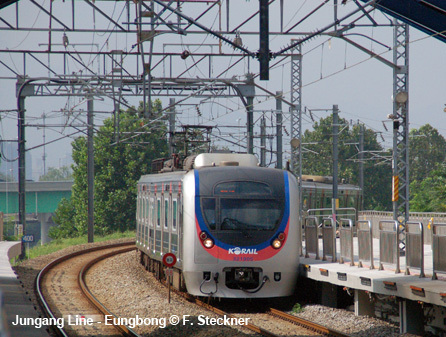 Originally shown on maps in red it is now the dark blue line together with several Korail branches which are operated jointly. 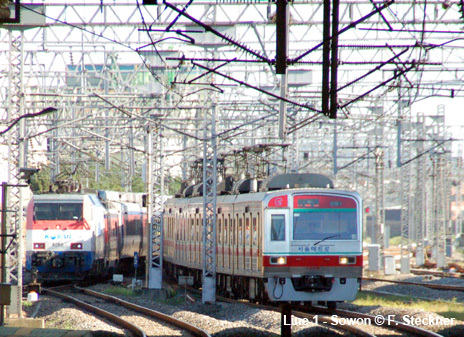 Like other Korail lines, this line is operated on the left. 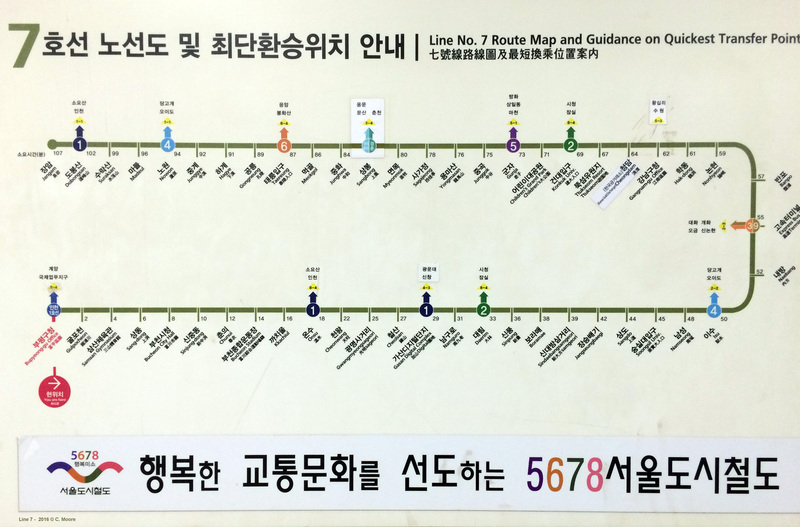 On 16 Dec 2005, the Yongsan - Hoegi branch via Oksu was separated from Line 1 and extended on a new route east to Dokseo. 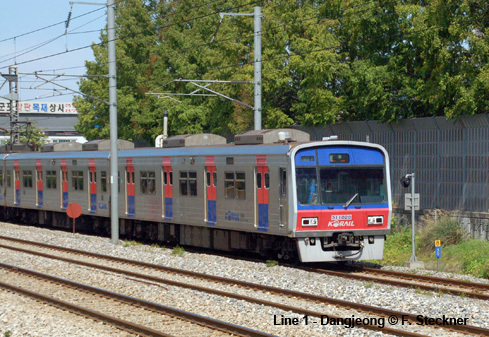 Line 2 was built 1978-1984 together with the Seongsu - Sinseol-dong branch, the second branch Sindorim - Kkachisan was built 1989-1993. Dangsan bridge was closed for reconstruction in 1996 and reopened on 22 November 1999. 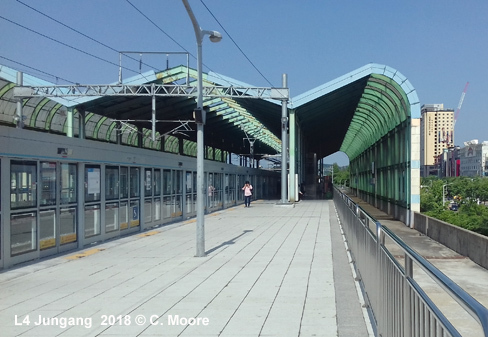 The old steel girder bridge was substituted by a 1.3 km long concrete bridge between Dangsan station on the southern side of the river and Hapjeong on the northern bank. 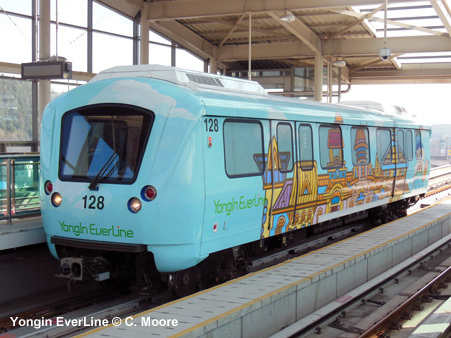 Headways on the line can now be reduced to 30 seconds, off peak intervals 5-6 min. 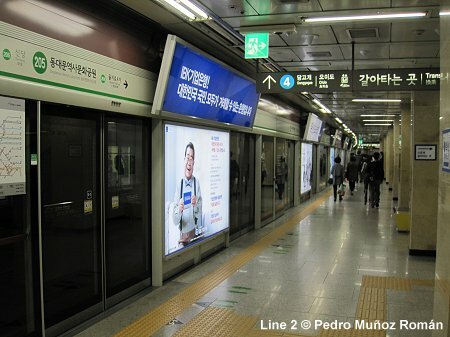 The line connects the city centre to Gangnam (south shore), the second city centre. 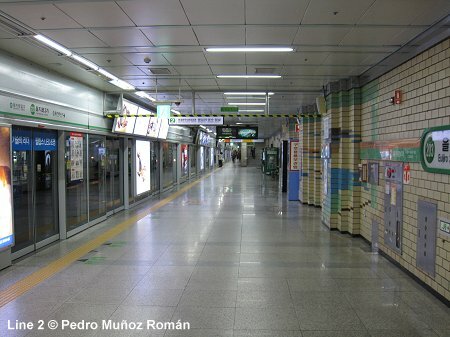 Line 3 was built 1980-1993 and connects north-western end of Seoul to city centre and Gangnam. 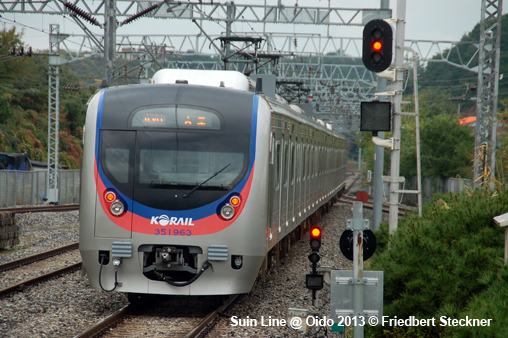 Through operation on Korail Ilsan line (right-hand running) from Jichuk to Daehwa. 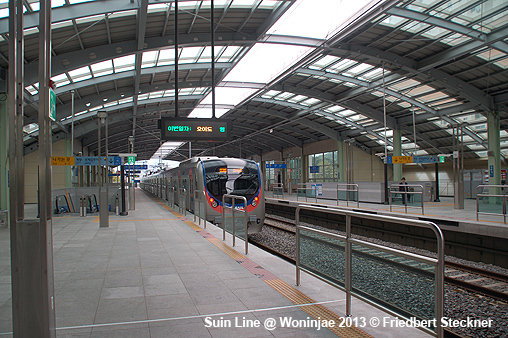 Wonheung station was added between Wondang and Samsong on 27 Dec 2014. 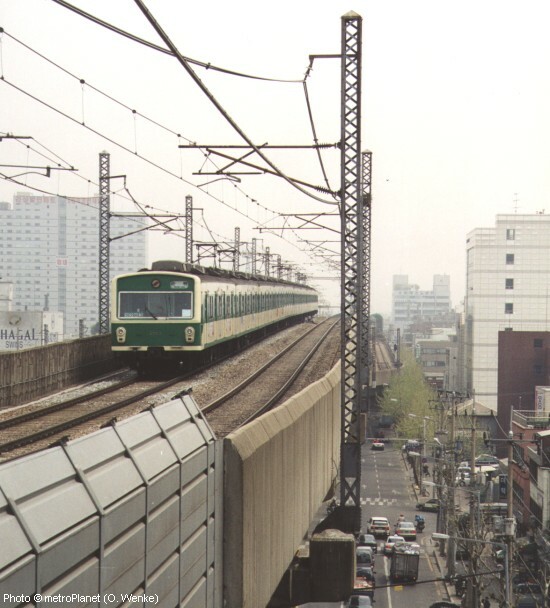 Line 4 was built 1980-1994 and connects the densely populated northeast to the south via old city centre. 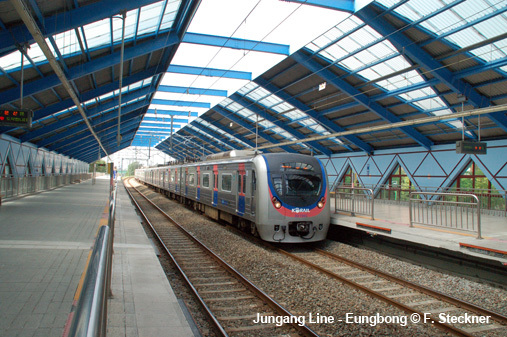 From Namtaeryeong it is linked to the Korail Gwacheon Line to Ansan. 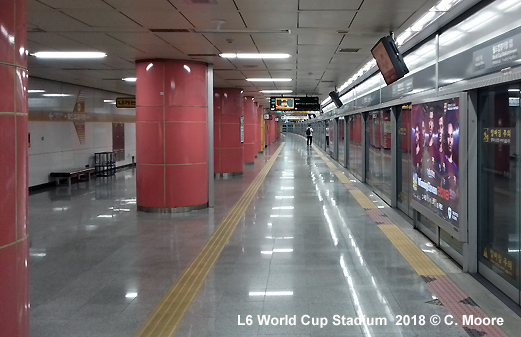 Line 5 was built 1990-1996 and is an important east - west link including Gimpo International Airport and the Youido business area. 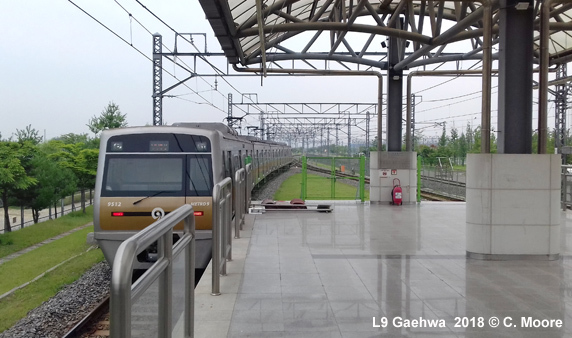 Line 6 opened its first section 7 Aug 2000: Bonghwasan - Sangwolgok 4 km. 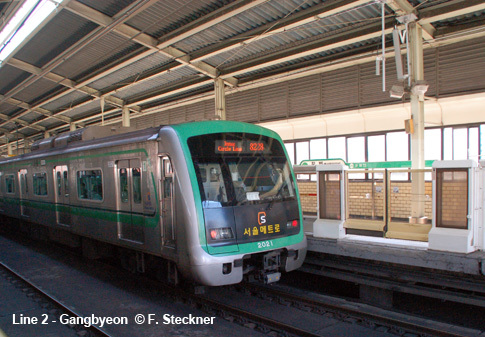 On 15 Dec. 2000 the remaining section (27 km) was also put into service although 4 stations in central Seoul had not been finished by then (Itaewon - Yaksu). These stations were finally operable on 9 March 2001, which concluded the ambitious expansion programme carried out in the 1990's. 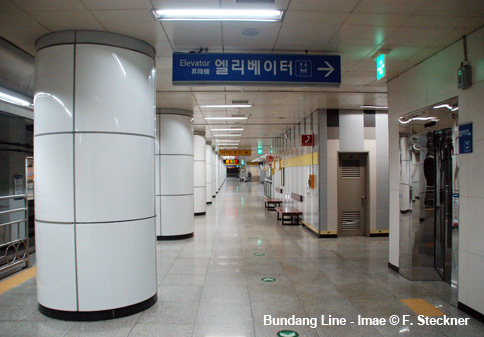 The transfer corridor at Singdang (to Line 2) did not open until 3 Aug. 2001. 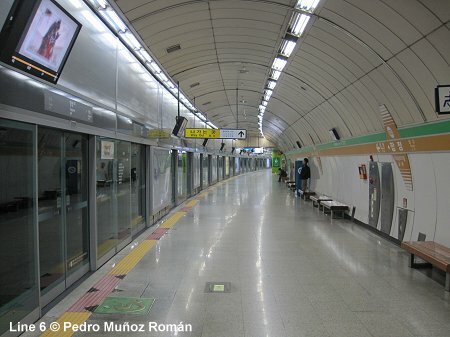 Line 7 was built 1990-1996 (Jangam - Konkuk Univ.) 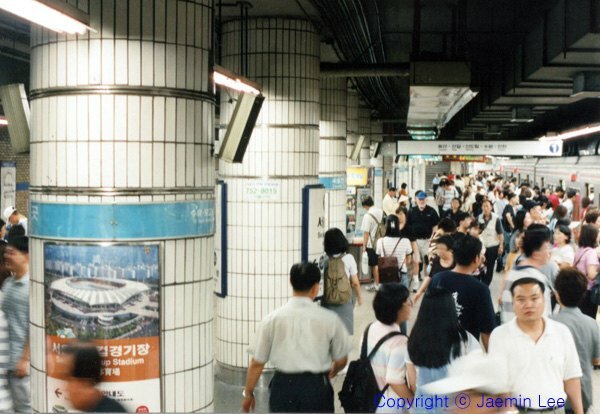 and was finished 1 August 2000 (central section 17 km Konkuk University - Sinpung). 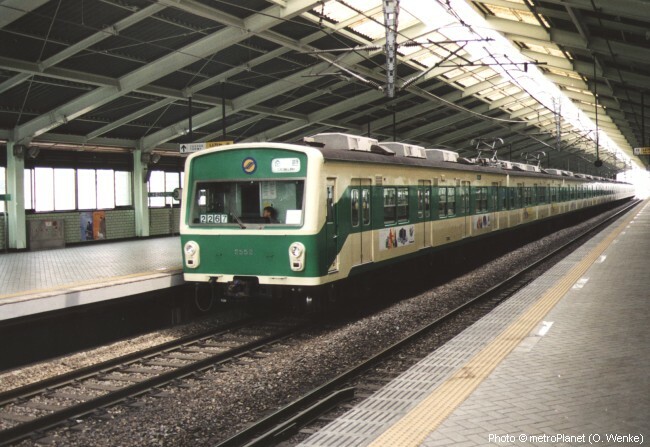 The western section between Sinpung and Onsu was put into service on 29 Feb 2000. 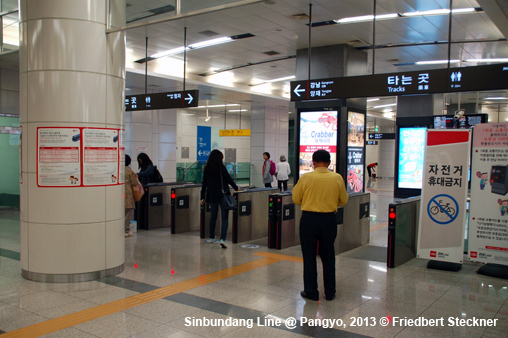 This north - south line does not run through the city centre but links Gangnam directly to the northern parts of town. 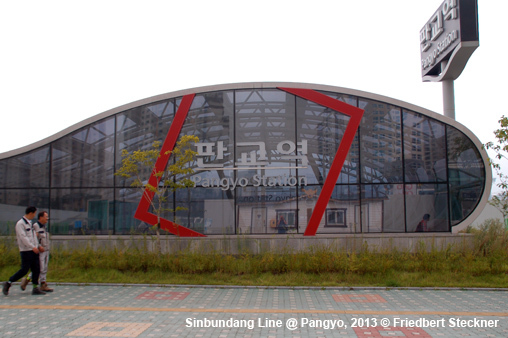 On 27 Oct 2012 it was extended west by 10.2 km from Onsu to Bupyeong-gu Office where it links up with Incheon Subway Line 1. 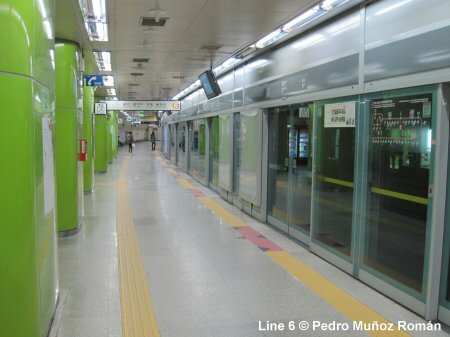 Line 8 was built 1990-1999 and mainly serves the south-eastern parts of Seoul and the satellite city of Songnam. 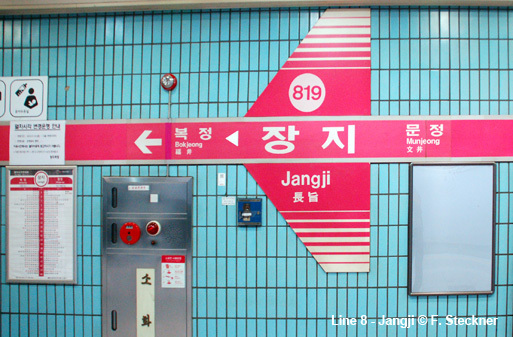 Jamsil to Amsa opened 2 July 1999. 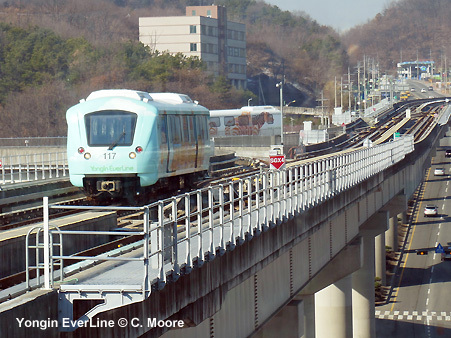 Line 9 was built from 2002 onwards, and the first 25.5 km section between Gaehwa and Sinnonhyeon opened in 2009. 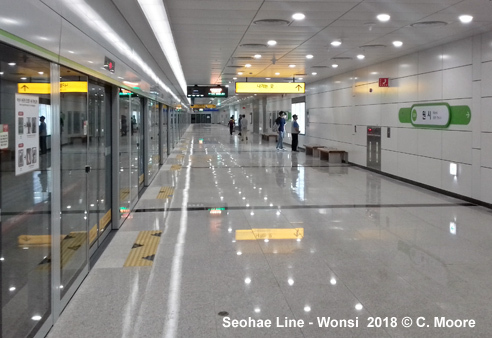 Line 9 is triple-tracked and thus Seoul's first subway line to offer express services. 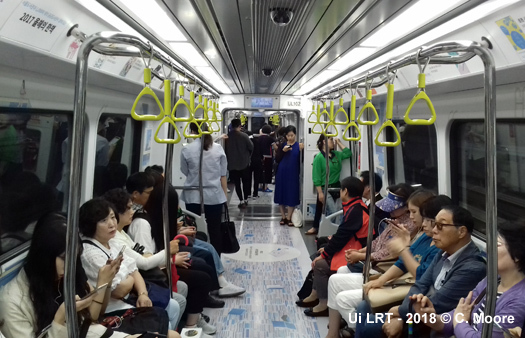 Run under a 10-year contract by Southlink 9 Company Limited, an operating company 80%-held by Veolia Transport Korea and 20% by Korea's ROTEM group, it is also Korea's first privately operated subway line. 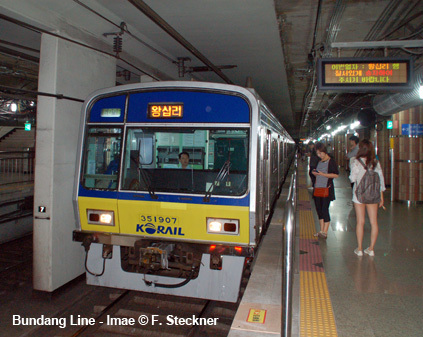 Bundang Line (K2) - Subway Line operated by Korail from Seonneung to Ori, extended from Suseo to Seolleung in Sept. 2003. 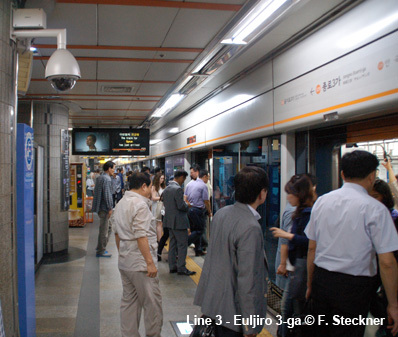 Guryong station was added 24 Oct 2004, and Jukjeon on 24 Dec 2007. 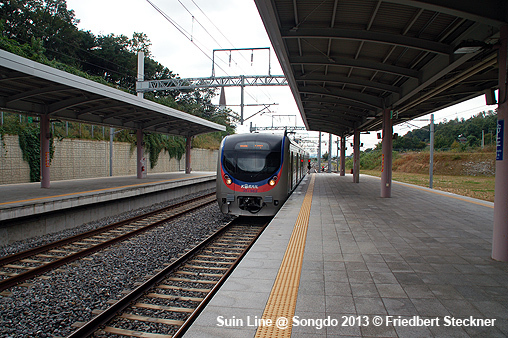 Extended south on 28 Dec 2011 from Jukjeon via a new permanent station at Bojeong to Giheung. 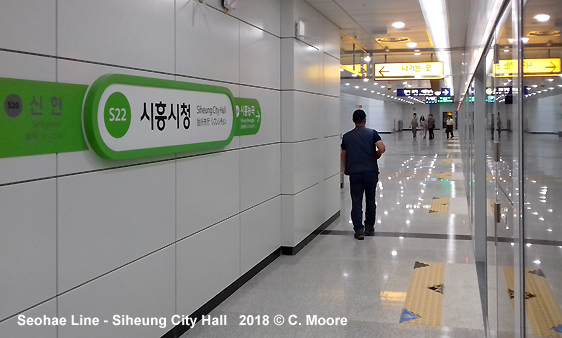 The extension into the city centre, from Seolleung to Wangsimni (6.6 km) opened on 6 Oct 2012. 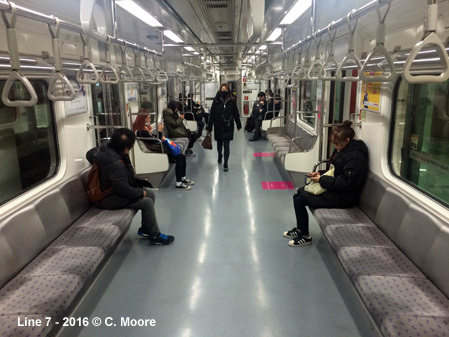 This was followed on 1 Dec 2012 by a 7.7 km southern extension from Giheung to Mangpo in Suwon. 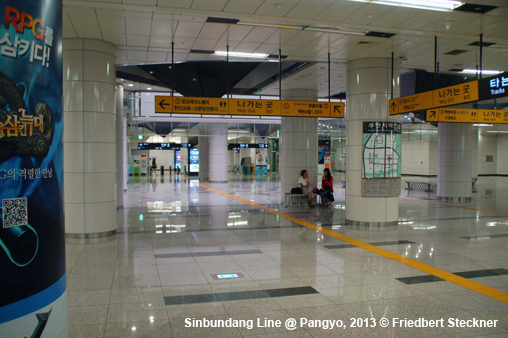 It was finally extended to Suwon railway station (Line 1) via Suwon City Hall on 30 Nov 2013. 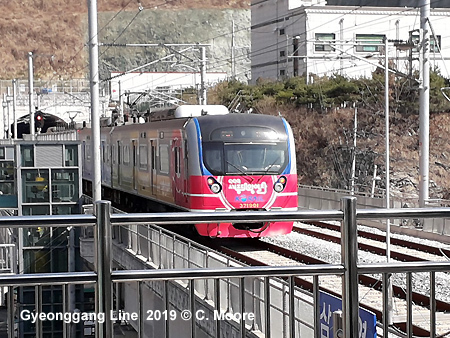 As of 31 Dec 2018, some trains continue north from Wangsimni to Cheongnyangni using Gyeongui-Jungang Line tracks. 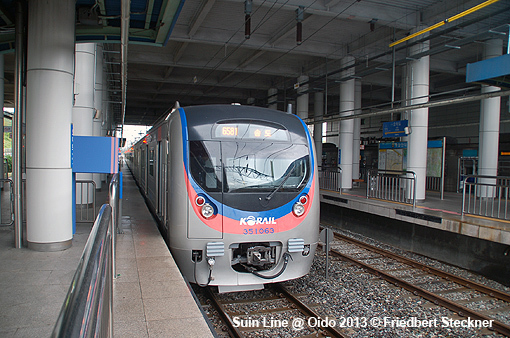 The Suin Line was opened on 30 June 2012 from Oido to Songdo; this may eventually become part of the Bundang Line. 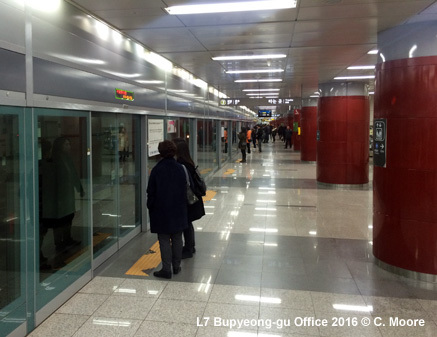 Darwol station was opened on 27 Dec 2014. 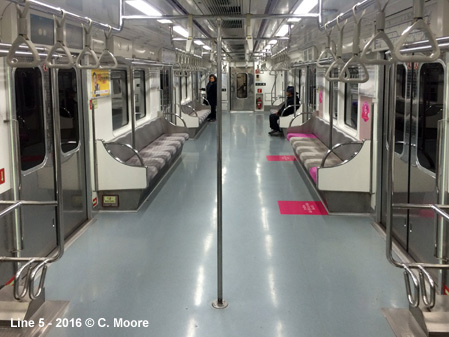 A further extension west to Incheon opened on 27 Feb 2016. 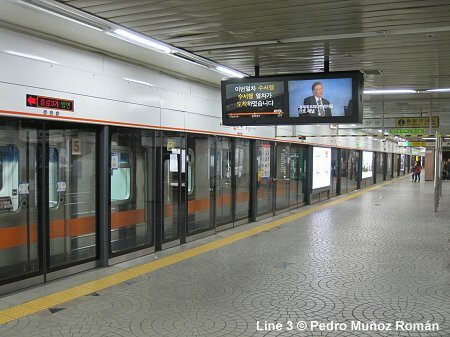 Shin Bundang Line (DX Line) - 17.3 km, opened 28 Oct 2011 from Gangnam station (Line 2) via Yangjae station (Line 3) to Jeongja station (Bundang Line). 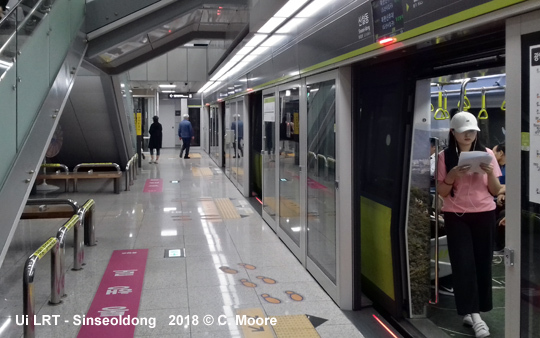 On 30 Jan 2016, the Shin Bundang Line was extended south to the Gwanggyo university area in Suwon, adding 12.8 km and bringing the total length of this driverless express metro to 30.1 km. 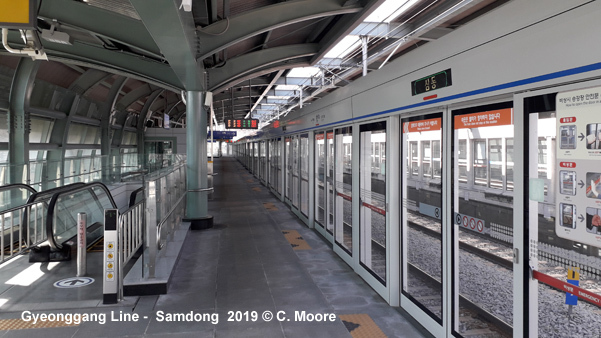 Migeum station was only brought into service on 28 April 2018. 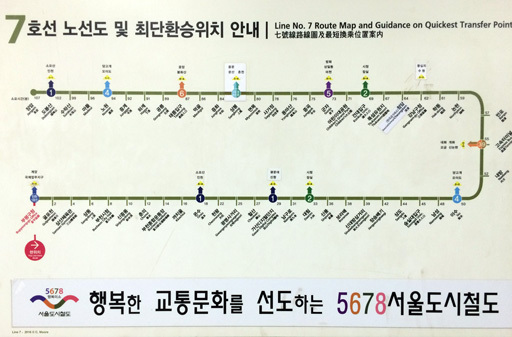 124.5 km suburban cross city line created on 27 Dec 2014 when the eastern and western legs were connected via a new section between Gongdeok and Yongsan stations. 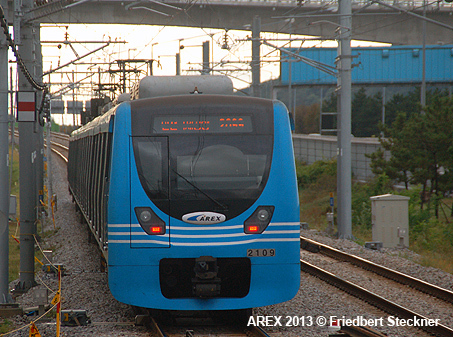 AREX - The first leg of the airport express line opened on 23 April 2007. 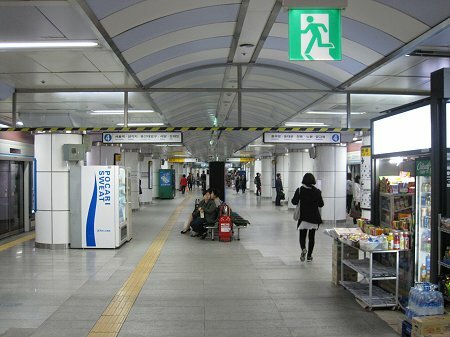 This segment connects Incheon International Airport and Gimpo Airport. 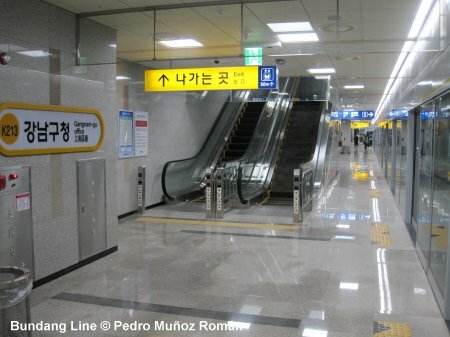 One of the intermediate stops is at Gyeyang, the northern terminus of Line One of Incheon's subway. 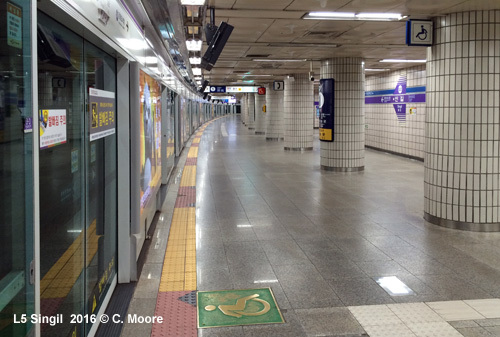 At Gimpo, passengers can transfer to Line Five of the Seoul subway. 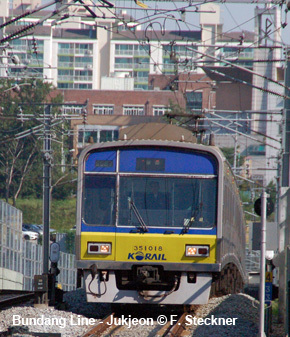 The second stage, which connects Gimpo Airport to Seoul Station, was brought into service on 29 Dec 2010. 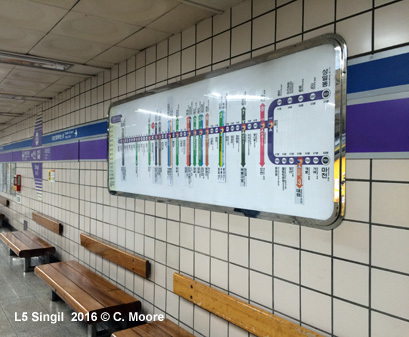 Gongdeok station was added on 30 Nov 2011, Cheongna International City on 21 Jun 2014, and Yeongjong on 26 March 2016. 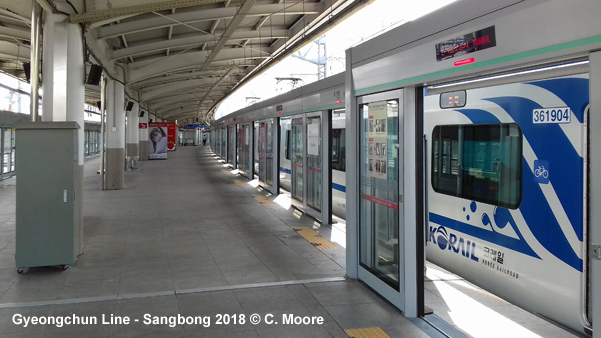 On 13 Jan 2018, AREX services were extended to Terminal 2. 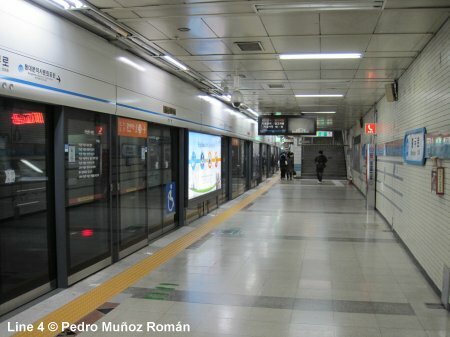 Uijeongbu VAL line - labelled the 'U line' - opened 1 July 2012 - 11.1 km line with 15 stations functioning as a feeder to Seoul's Metro line 1 at Hoeryong station in the northern suburb of Uijeongbu. 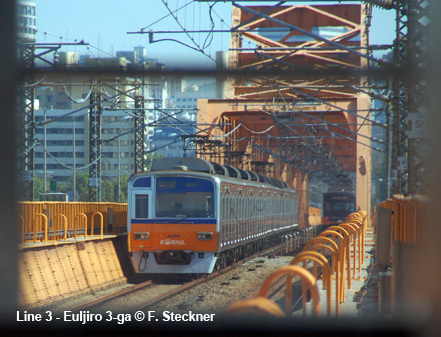 The line uses known Siemens VAL technology as in use in French cities like Lille, Toulouse or Rennes. 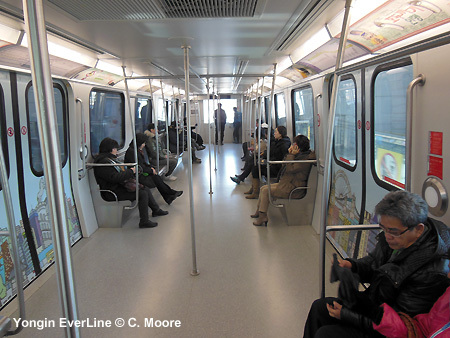 The EverLine Rapid Transit System in Yongin City began construction in Nov. 2005, but took until 26 April 2013 to open. 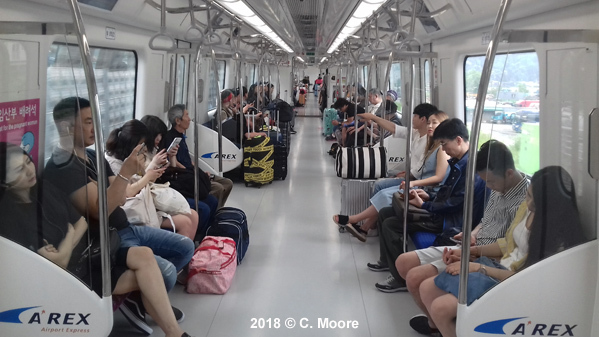 The mostly elevated, driverless system uses Bombardier CITYFLO 650 automatic train control technology. 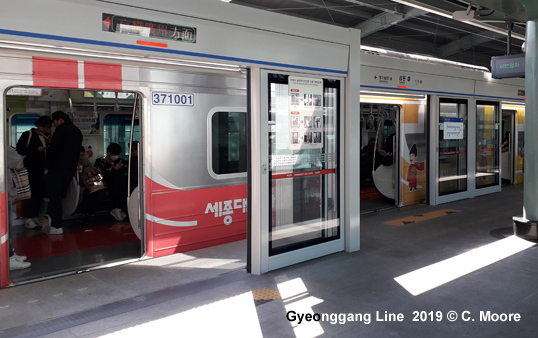 The 18.2 km line has 15 stations and links Giheung station on the Bundang Line to the Everland area, one of the world's largest amusement parks, via Yongin City, located in the southeast of the metropolitan area. 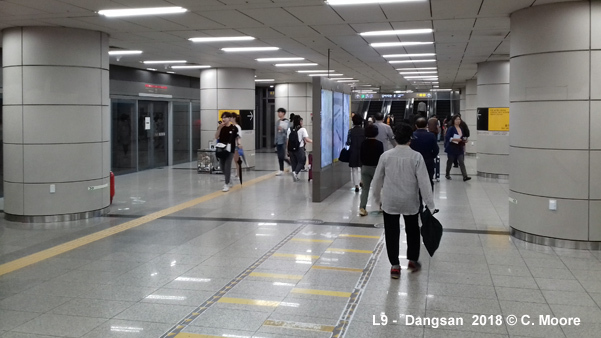 Though labelled LRT, this is a fully underground light metro line (11.4 km) opened on 02 Sept 2017, linking the the Sinseol-dong hub (L1, L2) to Ui-dong, hence the name of the line. 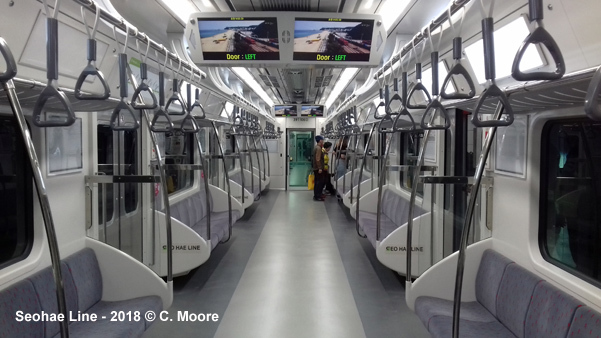 The line is operated by driverless 2-car trains from Rotem.